Image caption A BBC Weather Watcher photographed the effect of Storm Gareth at Prestwick on Tuesday afternoon. Wind speeds hit 75mph in Scotland as Storm Gareth advanced across the country. The Met Office warned of continued travel disruption until 15:00 covering much of the west coast. 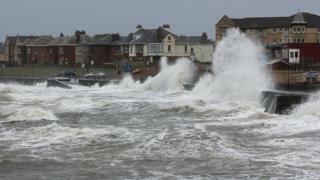 BBC Scotland Weather said winds had reached storm force across Argyll with a gust of 75mph at Machrihanish. 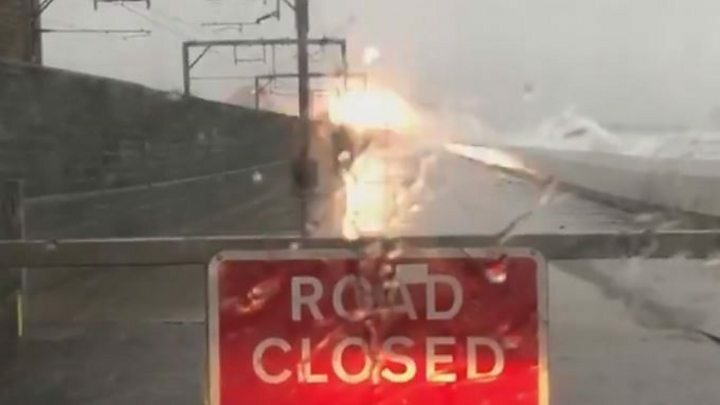 Police warned of "exceptionally difficult" driving conditions across the country with rail and ferry services also affected. Flooding had already affected many parts with alerts in place in southern and western areas. Sepa put out flood alerts for nine areas: Ayrshire and Arran, Argyll and Bute, Central, Dumfries and Galloway, Scottish Borders, Skye and Lochaber, Tayside, West Central Scotland and Western Isles. ScotRail reported that a tree had fallen on to overhead wires between Irvine and Kilwinning, damaging and bringing them down. Trains were unable to run between the two points, affecting Glasgow Central - Ayr services. There is also widespread disruption on ferries with a number of services cancelled. In Dumfries and Galloway, as a result of the ferry disruption the A751 has been shut as lorries unable to travel further are stacking from the A75 to A77. Strong west to northwesterly winds are expected until Wednesday afternoon with the Met Office saying bus and train services could be affected. Short-term loss of power and other services are also possible. A number of areas were hit by flooding or strengthening winds ahead of the storm. In Dumfries, the Whitesands area was flooded with fairground rides being affected as water flowed into car parks. In Galashiels, the A6091 Galafoot Bridge was closed in both directions for several hours due to fallen power cables. In the Borders, the B712 was shut due to flooding while Calmac reported disruption on a wide range of ferry services. Media captionOverhead wires tripped out near a train during Storm Gareth. Scotrail said that due to the worsening conditions at Saltcoats sea wall its Glasgow Central to Ardrossan/Largs services would terminate and start back from Kilwinning. It said replacement buses would be in operation. Charts used by surfers to find big waves forecast wave heights of 30ft (9m) or more out to sea off Scotland's west coast. Magicseaweed.com said they were likely to be the last big swells of the winter. A spokesman said: "With spring officially open from 20 March, this looks to be the biggest swell before then. "The long range forecast suggests there will be another smaller swell pulse on 18 March, but at the moment it doesn't look to match up to what we're going to see over the next few days." A snowsports event to be held at the Glencoe Mountain Resort on Wednesday has been cancelled due to the high winds that have been forecast. The organisers of the Red Bull Homerun said the decision was taken for safety reasons. The competition, which was due to be held for the first time in the UK, involves entrants making a sprint for their skis or snowboard and then sliding the rest of the way to the finish line.